Prof. Norhan Fanaky, the Vice-President for Education and Student affairs. Prof. Awny Rahmy, the Dean of the faculty of Physical Therapy. Dr. Mennatallah Gowayed, PUA International Relations Coordinator. Prof. Ahmed Aziz, the International Relations Coordinator of the faculty of Physical Therapy. The two parties agreed upon promoting cooperation between the two universities. In addition, Prof. Winfried Banzer was assigned two courses entitled as “Sports Injuries” and “Medical Training Therapy” to teach during the next fall and spring semesters. 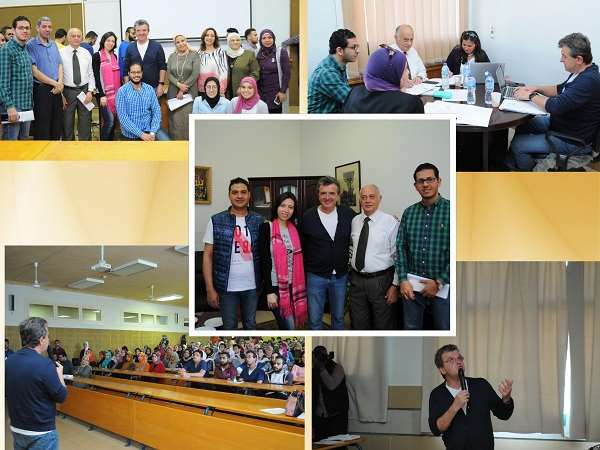 During the visit, Prof. Winfried Banzer also gave a lecture entitled as “Return to play” to the fourth year students.